Sean Dyche hopes his players and the Clarets fans can draw on a sense of injustice and create one of THE Turf Moor nights to remember. Burnley host Greek giants Olympiakos in the second leg of their Europa League play-off on Thursday night, trailing 3-1 on aggregate. But the events of the second half left a bitter taste, as, with the score at 2-1, Ben Gibson was harshly adjudged to have handled in the box, when the ball appeared to hit his hip, then his arm. And to make matters worse, the £15m summer signing was incredulously sent off for a second bookable offence, leaving the Clarets to play out the last half hour in searing heat with 10 men. The club were unhappy at events at half-time, with Olympiakos owner Evangelos Marinakis believed to have entered the referee’s room, to berate the officials after the hosts had two first half penalty claims turned down, while Burnley were awarded, and scored, one of their own. The home bench spilled onto the pitch in Athens before the break when Slovenian referee Slavko Vincic turned down a second penalty appeal, for handball against Stephen Ward, before more than a dozen staff ambushed Vincic and his assistants in the tunnel, with director of team operations Dourekas Kyriakos reportedly chasing after the officials. The incident was excluded from reports submitted by the referee and UEFA delegates, meaning it is unlikely it will be investigated. Asked if the side can use the injustice, Dyche said: “Can we use it? I think the lads have enough fuel anyway. “We’ve said we’re taking this seriously. We showed that on Thursday night and it was a good game until the change in it – a balanced and tight game. “I think the mentality of the players will be to go back and give a good account of ourselves at Turf Moor. “I think the fans who travelled, word will spread quickly. “I think they will feel a bit of an injustice so they will pass it through as fans. “They’ve travelled a lot of miles and the main thing for me is to see 11 v 11 and get on with it, let’s see the game. 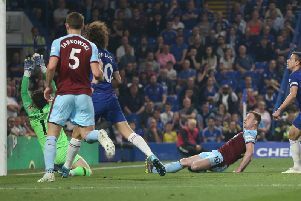 Chris Wood’s away goal has at least given Burnley a semblance of hope of extending their European adventure, with a 2-0 win good enough to send them through on the night. Dyche added: ”Everyone knows we’ve got a strong jaw and strong mentality. “I thought we affected the game well before going down to 10 men and even then we never really looked in drastic trouble. We had good shape and good energy. “Corky was unbelievable with his effort and his will, Tarky came on and it’s not easy, he looked solid. “There were a lot of good habits for the side. “There’s some life in it. “We hope we can take the away goal back to Turf Moor and make a game of it.